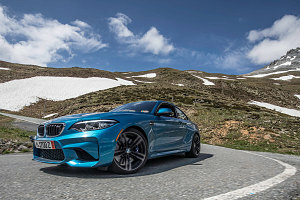 We awake to another sunny day in the alps - the sixth day of our trip and the third since completing the M2's break-in period. 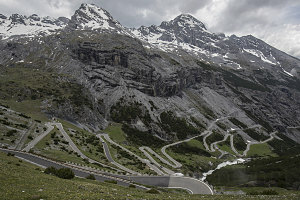 Today we're going to visit a highway celebrity: the famous Stelvio Pass, known far and wide by car, motorbike, and bicyclist enthusiasts. 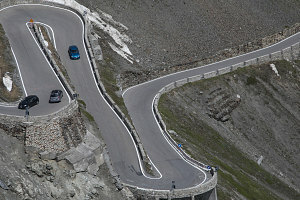 The pass was made extra famous by the British motoring show Top Gear in 2007, when it was named their "Greatest driving road in the world" (for the record, I'll have you all know that I first visited the Passo dello Stelvio back in 2005, *before* that designation was given). 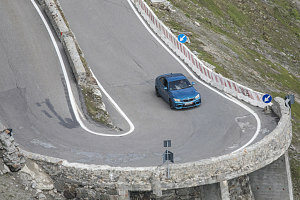 Anyhow, the Stelvio Pass was probably going to be the highlight of the day. 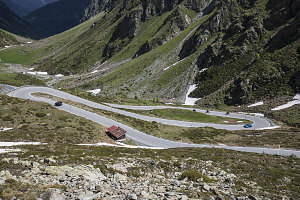 Apart from that, we'd be travelling through some likely excellent scenery in the Swiss National Park, up and over another potentially twistyful pass known as the Umbrailpass, and we were today planning on not coming back to the Swiss flat for the night. Instead, I had picked out a quiet mountain Rifugio in the southern ramparts of the Italian alps. In fact, today was the start of a three-day loop away from the flat, staying at remote mountain lodges and rifugios along the way. 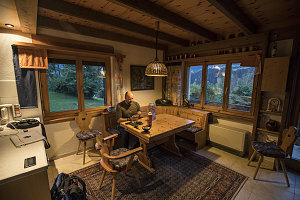 After an at-dawn breakfast at the flat, we headed east again, following Swiss highway 28 through the Swiss National Park and over the not-that-twisty Flüelapass and Ofenpass. Luke and I spent some time trying to capture some footage from our GoPro camera, trying out mounts on different parts of the car. There was an annoying clanking sound that was picked up by the camera's mic, requiring some time to try and debug and resolve. 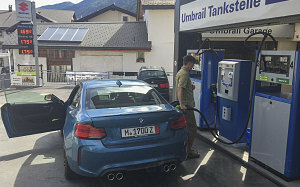 The scenic drive through the Swiss National Park brought us to the little community of Santa Maria val Mustair, where we stopped for a gas fillup and a nice bit of mid-morning strudel. From here we started up a "destination" road: the Via Umbrail leading up to the Umbrailpass. The Via Umbrail was one of the "good roads" marked on my personalized twisty road map, and it was indeed excellent. Beautifully-paved and not that busy, and even the tightest of the turns were fairly spacious. Perhaps the only minor complaint is that there weren't quite enough twisties. More, please. 5:00am wake-up. 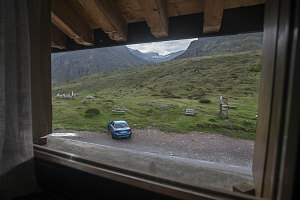 Heading to the Stelvio Pass and somewhere overnight in a Refugio. Andrew's driving and forgetting to use the quick turn signal feature. It's funny. He can't retrain his brain on this one. Not as instantly as he adapts to other things anyway. Flüela Pass first. This one is wide open with great sight lines. Up in the snow field and a large frozen lake. Tires have amazing grip even in the cold. 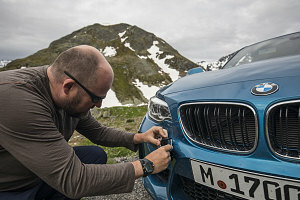 Ofenpass next, after messing with getting the GoPro mounted in the front of the car. Need to add some tape to stop it vibrating. Not impressed with mounting system and weak wi-fi. Can't control the GoPro from the car. Tech feels about 10 years old - mind you, it was free and it does work, so can't complain too much. Next time we will buy a newer one. Radio charging annoyance. The baseplate seems not to work, so the radio is now plugged in to the cheapie-feeling car charger but there's no indication that it is charging. Will wait a while and then check. 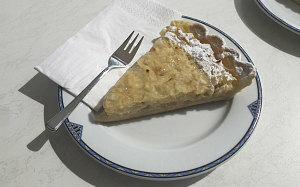 Heading up to the Stelvio Pass now, but first a quick stop for gas and some yummy apple flan! 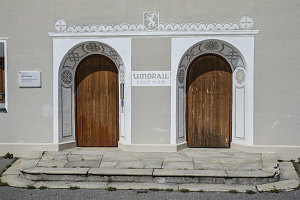 Umbrail Pass first, leading up to the Stelvio route. Amazing. But narrow. Yikes. Lots of motorcycles and cyclists. Motorbikes like to go fast in a straight line but the hairpins are grim for them. 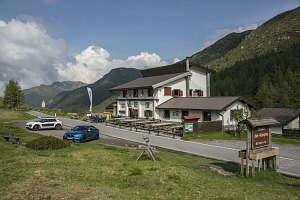 It was only a short distance from the end of the Umbrailpass road to the top of the Stelvio pass, but even so, we suddenly encountering a much high load of cars and motorbikes and cyclists. But, of course... this was to be expected. 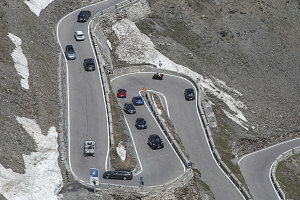 After all, this was the world-famous Stelvio Pass Road. Reaching the top of the pass, we looked down on the northeastern approach - the most famous part of the road - with its hard-edged, tortuous, and unending switchbacks. Cars and motorbikes and cyclists were crawling up and down it like ants. Now at mid-morning, the pass itself was also super busy. Congestion of all kinds (both people and vehicles), busy souvenir shops and food stands. As a spectacle, it was pretty cool to be here. But.... probably... er, definitely wouldn't want to spend all of my time at places like this. 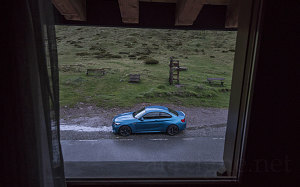 I wanted to get some shots of the M2 on this famous bit of tarmac, so I placed myself at a high vantage point with a bunch of high-zoom camera gear, then sent Luke off down the north/east approach. 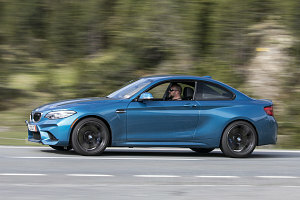 Mostly he didn't get much sporty driving in - I could see that. Instead he was crawling along or even stopped, waiting for long lines of super slow vehicles to inch their way cautiously around the bends. It was pretty apparent that during the busy part of the day, there's no motoring fun to be had on this highway. 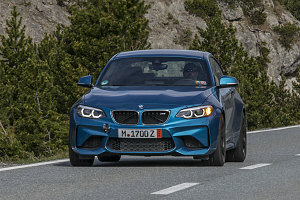 Furthermore, even if the road was clear, the turns are a bit too sharp and the width a bit too narrow for serious motoring fun. What were the Top Gear guys thinking, anyway? 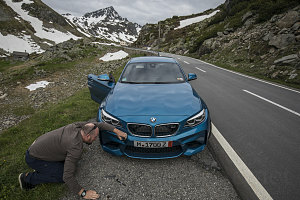 It's a cool road, to be sure - but clearly not the best for the motorsports enthusiast (to be fair, they later updated their best roads list to give the top award to a highway in Romania). 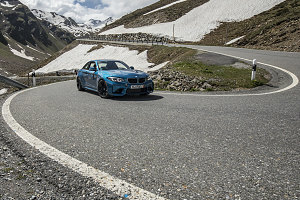 After doing our photo shoot up and down the hairpins, we returned to the pass itself, where we managed to get ourselves captured on the Stelvio Pass webcam (proof we were there! ), and to partake in some quite good food-stand grub. And, I discovered something new: Luke does not like sandwiches with meat in them if the meat is not hot. Not a cold-cuts kind of guy. But don't worry - the meat was hot today. 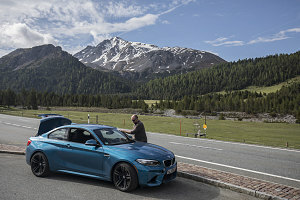 After our Stelvio Pass lunch, it was time to move on to a new destination, hopefully away from the crowds and congestion. 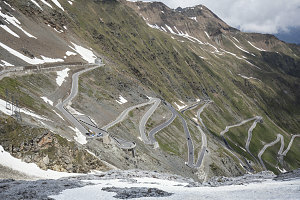 We headed back west, then south, driving down the southern approach to the Stelvio. 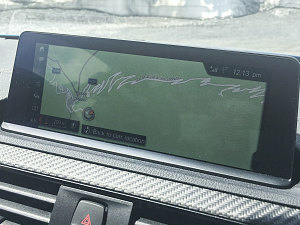 After passing the junction with the Umbrail pass road, the highway descended in a beautiful and tight section of twisties - much more suitable for fun driving than the northern/eastern approach. 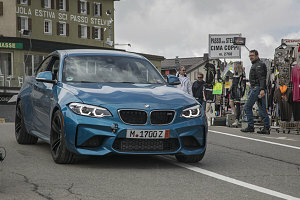 There are a few really narrow tunnel sections on the southern approach to the Stelvio, but overall it's quite good - although again fairly busy. 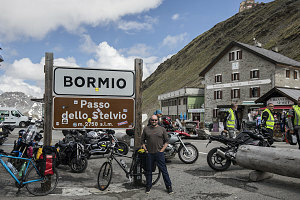 All the way down to the town of Bormio, we went, at the southern end of the National Park of the Stelvio (in addition to the pass itself, the whole area to the south of it is a National Park). In Bormio we discovered a very fine self-operated spray wash - just the kind that Luke and I like for doing safe and quick cleaning jobs. We stopped to give the M2 a much-needed de-grime-ing. 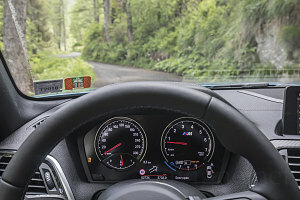 Continuing south deeper into Italy, we followed several valley systems until we came to a very, very little route that led up a steep and forested valleyside and to a low pass in the foothill mountains of Lombardia. Only at the very top of the pass did the trees finally thin out into an area of alpine meadowland. 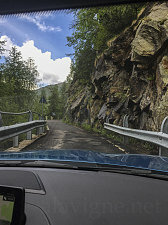 The road - the Strada Provincial 294, or SP294, was incredibly narrow - maybe 2 metres wide in most places, but weirdly, it was mostly really well paved. 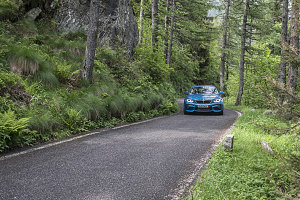 There was no way to charge up this road with the narrowness and limited forest sightlines, although it was quite twisty. 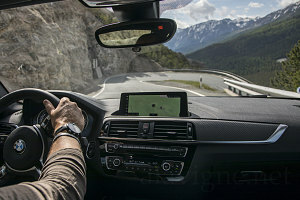 So... why did we come up this narrow little backway, if not for he sporty driving? 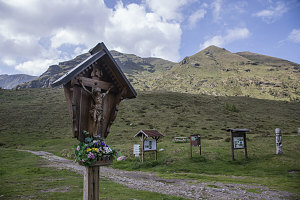 Well... at the top, at the saddle across the top (known as Passo del Vivione) stood a tidy little Italian Mountain rifugio. 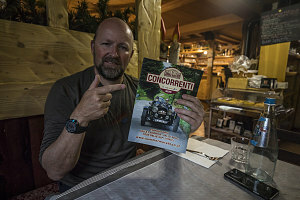 I had spotted the road and the rifugio on my planning map, and thought it might make an excellent place for us to stay for the night. I had called earlier in the morning and I was happy to hear that they indeed had two bunks for us - in fact they had a private 2-bunk room for us. 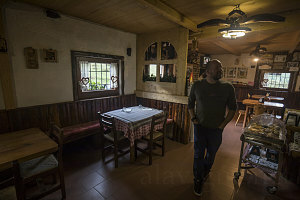 Now for those of you who don't know, rifugios (or hutte or refuge, depending on the language) in the alps generally follow this pattern: rustic in style, usually finished with lots of ornate wood accents. With multiple floors and often a mix of shared bunk areas and more private multi-bed rooms. 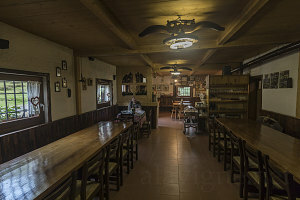 Virtually all of them contain a bar and a dining area, and offer full food service (breakfast, lunch and dinner). Some are situated in the high alpine, only reachable by foot. Others - like this one - are situated on the side of a road, usually still high up in the mountains somewhere, often at a pass. The rifugios that are car accessible usually have slightly better amenities, but usually they are all generally well-equipped. This rifugio - the Rifugio Passo del Vivione - was no exception. Quaint, tidy, stylish. When I arrived at made my presence known, they presented us with our private 2 bed room on the second floor, and then casually mentioned that hey... they weren't busy, and if we wanted, we could each have our own separate bedroom for no extra cost. Sure....! The rooms were great - especially Luke's, which was very large and had a nice big separate bathroom with its own shower (often in rifugios, the bathroom and showers are common and shared). This was approaching the level of multi-star hotel. Luke was... impressed. I think he'd been expecting a set of bunks under a tin roof with an outhouse somewhere out in a field. Ok, did the Stelvio Pass. Now I can say I did it. Was busy, with teeming groups of motorcyclists milling about, and a lot of really fit looking cyclists sweating and puffing. Not surprising after that climb!!! The surface wasn't the best. Kinda rough in places and extremely tight. At one point I had to completely stop at the inside of a hairpin and let a whole gaggle of bikers come through the other way before I could descend. The corners are almost too tight. No, strike that, some of them actually are! 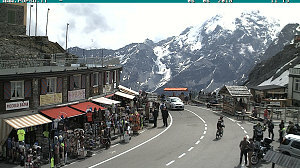 Onward from Stelvio to our rifugio for the next night....and what a place. 46 euros for my own room and my own personal bathroom, with a bidet and shower no less! Andrew says they are all like this. Oh and that includes dinner and breakfast by the way!!!! I had booked was is commonly called "half-board", or mezza-pensione in Italian. That includes the room, dinner, and breakfast in the morning. Both the dinner and breakfast are served at specific hours, and it was now time for dinner (which in this rifugio is served at 7pm). We wandered downstairs to the spacious dining room, which looked like it could hold thirty or forty people. There were exactly two people in the dining room tonight: us. One of the custodians of the hut came out and asked us what we wanted for our dinner (usually one or two choices of each of the main courses of dinner are offered). I also confirmed with her that, yes... Luke and I were the only guests staying at the rifugio tonight. Our own private hotel - sweet! Luke continued to be increasingly impressed as the excellent food and drink was rolled out to us over the next 45 minutes. Most civilized, it was. Outside, the sunny afternoon had given way to a dank, lightly drizzly evening. 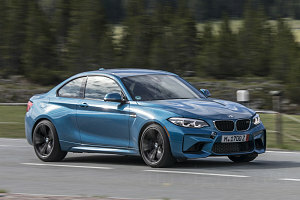 The M2 sat alone in the roadside parking area just across from us. Patient, poised and waiting. 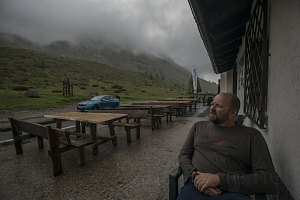 After dinner, we let our food digest while sitting under the awning of the rifugio's outdoor patio, just out of reach of the drizzle. We chatted and watched the low clouds slide by, reflecting on the amazing roads and scenery and experiences of just the last two or three days. Then, as the dark wet grey began to sank towards full darkness, we retreated inside to get a nice solid night of sleep. Breakfast was set for 7pm, so we lots of shut-eye time ahead of us.